Some sensational performances and amazing matches were seen today at Roland Garros. 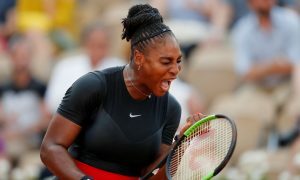 Marin Cilic from Men’s Tennis and Serena Williams and Simona Halep from Women’s Tennis made it to the next round of the French Open 2018. Result: Juan Martin del Potro defeated Albert Ramos Vinolas at the French Open by 7-5, 6-4, 6-1. The Spaniard, Albert, faced the World No.6, Juan Martin, in the round of 32. Albert was a tough opponent and struggled very hard throughout the match but Juan wasn’t a piece of cake to beat easily. The first set was tough for Juan as he barely won from 7-5. In the second set Albert lead Juan in the start but Juan came back in action after some time and won the second set too by 6-4. It was all down to the third set of their match. As the set started, Juan took the lead by a big margin and eventually won the set by 6-1. It was a great win for the Spaniard against a tenacious opponent as Juan made his place in the next round. Juan Martin will be facing the American, John Isner, in the round of 16 in the French Open 2018. 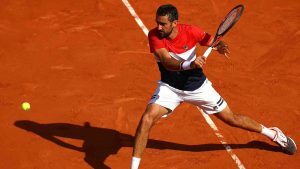 Result: Marin Cilic defeated Steve Johnson at the French Open 2018 by 6-3, 6-2, 6-4. Both the players Marin and Steve played at their best against each other in the French Open 2018. Marin took a good start by strucking some aces and won the first set by 6-3. In the second set, Steve also played well in the start but Marin kept on winning the points and eventually won the second set too. The third set was the last chance for Steve Johnson which could help him to survive the match. As the third set started Steve struggled hard and took the lead. But Marin Cilic didn’t make it easy for him and struck back with some good forehands and backhands and defeated Steve by 6-4. Marin Cilic made it to the next round where he will be playing against the Italian Fabio Fognini. Result: John Isner defeated Pierre-Hugues Herbert at the French Open 2018 by 7-6(1), 6-4, 7-6(4). Pierre was a tough player to beat in the round of 32 as he was a better player than John. The first set was worth-watching as both the players were fighting bravely to win this set. The score tied and the set was decided on a tie. John won the set on the tie by 7-6(1). The next set started as Pierre really needed to win that but despite his great efforts, John won the set and afterwards the decisive set was played. Both the players showed their exquisite performance on the court as the set was decided on a tie. John again won the set on the tie and booked his name in the round of 16. Juan Isner will be facing the Argentine, Juan Martin del Potro, in his next match of the French Open 2018. Result: Simona Halep defeated Andrea Petkovic by 7-5, 6-0. A dazzling performance was seen on the clay court today of the Romanian, Simona Halep, against Andrea as she defeated her in the first two sets and won the match. Andrea played the first set with full power but Simona, World No.1, didn’t make it easy for her and won the set by 7-5. The second set started and Andrea needed a comeback so that she could play the next sets too. But Simona went on scoring points over her and won the set with 6-0. What a sensational performance it was by the Romanian against Andrea. Although, Simona made 4 double faults in the whole match but still she made it to the round of 16. Simona will be facing the Belgian star, Elise Mertens, in her next match at the French Open 2018. Result: Serena Williams defeated Julia Gorges by 6-3, 6-4 . What a sensational and an absolute performance it was by the American player, Serena Williams, in the match against Julia Gorges of Germany. Both were favourites to win this round but Serena as usual made it to the next round. Julia struggled in both the sets as Serena wasn’t easy to handle. Although, Julia strucked 11 aces in the whole match but still she lost. Serena on the other side, struck only 3 aces but she won the sets and made it to the next round. Serena Williams will be playing against Maria Sharapova in her next match at the French Open 2018. Result: Caroline Garcia defeated Irina-Camelia Begu by 6-1, 6-3. Caroline Garcia was the favourite to win this match as Irina lost badly against her in both the sets. The Frenchmen Caroline won the first set by a big margin of 6-1. The second set started and Irina grabbed some points but Caroline took the lead in a very less time and won the second set too. Moreover, Irina made a total of 9 double faults in the whole match which costed her the sets today. Now Caroline booked her name in the round of 16 in which she will play against Angelique Kerber of Germany at the French Open 2018. These were the highlights of the second half of the Men’s and Women’s Tennis. Join allsportspk as soon as possible so that you can see the French Open 2018 day 8.